The faceplate rings are designed with an internal dovetail to fit securely onto the standard jaws. The faceplates allow projects to be easily mounted and removed. They are available with an outer diameter of 3-1/8" (80mm) & 4-3/4" (120mm). 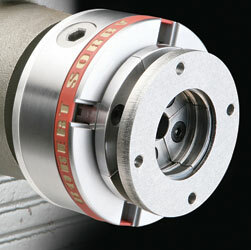 The faceplate rings are shown mounted on the Patriot Chuck, which must be purchased separately.